The kidneys are made up of two parts. One part forms urine from blood and the other part collects the urine. The renal pelvis is the part where urine is collected before its drainage in to urinary bladder via ureter. 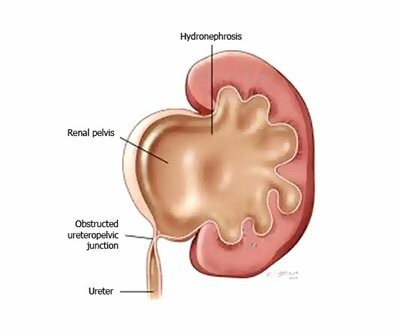 Sometimes the junction between the pelvis of the kidney and the ureter is very narrow resulting in swollen kidney filled with urine (hydronephrosis). This condition is called PUJ obstruction. How common is PUJ obstruction? PUJ obstruction is an uncommon condition found in 1 child out of 1500. It can be present from birth, but it can take time for the symptoms to appear. What are the symptoms of PUJ Obstruction? Pain, fever due to urinary infection, blood in urine and rarely lump in abdomen are the symptoms of PUJ obstruction. However, many cases are diagnosed while the baby is in the womb during ante natal sonography examination. How to diagnose PUJ Obstruction? Diagnosis is usually made by sonography examination. The sonography shows swollen kidney with dilated renal pelvis and a normal ureter. The doctor will ask for investigations like MCUG (micturating cysto urethrogram), renal scan and rarely IVP. What is the treatment of PUJ Obstruction? Not all PUJ obstruction cases require surgical treatment. Those cases in whom the kidney function is compromised or child is having symptoms (pain, lump, urinary tract infections etc.) are treated with surgery called pyeloplasty. Pyeloplasty is the surgical treatment of PUJ obstruction. In this surgery the affected narrow segment is removed and the ureter is joined back to the renal pelvis. Pyeloplasty improves drainage of urine from kidney and relieves the pressure from kidney. This leads to preservation of kidney function and cures the symptoms if any. It’s a safe procedure with excellent results. Are there any risks of pyeloplasty? The complications are rare. The common risks are; bleeding, infection, slight muscle bulging and urine leak.